I just spent the day in prison, and it was probably my favorite day in Mexico so far. I suppose I should explain that statement… After all, I have had many wonderful days in Mexico! On Thursday, I went with my pastor to a military prison to celebrate Mass, hear confessions, and have a Holy Hour (obviously, I wasn’t the one celebrating Mass or hearing confessions, but I did serve as an acolyte). We went with two other people from our church and a local religious sister who has been involved in prison ministry for many years. The day started when Father told me, “Don’t wear blue, red, green, or yellow.” All of this actually made sense, since I have worked with troubled youth in the past and I am very well aware of gang violence and related issues. Still, I did not know what to expect, and to be honest, I was a bit apprehensive. I knew, however, that everything we were about to do would be for His glory alone, and so I left it to Him, asking for the intercession of Our Lady of Guadalupe. In any case, after checking to see if it was O.K. for this estadounidense to enter the compound, we were escorted by several M.P.s through the rest of the checkpoints and finally to the prison chapel, where many of the congregation were already waiting for us. Upon arrival, Father got to work almost immediately, taking a couple of chairs out to a grassy field and began hearing confessions. Meanwhile, I started to help prepare for Mass and the Holy Hour. This experience in itself was very humbling, as the prisoners were asking me if everything was set up correctly. These were men with ranks from Private all the way to Major, who for whatever reason found themselves incarcerated, asking me for advice and direction, this backward hobbit of a seminarian from the Central Valley of California. What’s more, is that they were all so welcoming, prisoners and M.P.s alike. I could tell that many of these men had a deep faith and were truly attempting to seek God’s everlasting mercy. After confessions were over, we had Benediction to conclude the Holy Hour and then began the Mass. I will always remember the fervor and the strength with which these men sang! I assume some of it has to do with the discipline of the institution and their military training, but to hear their voices ring out in praise to God was truly an edifying experience. I now understand why a soldier’s battle cry can strike fear into the heart of his enemy! Following the Mass, we had the opportunity to gather and share a meal. So many of the conversations I had enlightened me to life inside the prison, and helped to show me the need for mercy and compassion in today’s world. A side benefit to all these conversations is that today, just nine days before I return to the United States and begin my Pastoral Year, I realized that I have actually learned some Spanish, and it was a joy to be able to connect with so many people on such a profound level (even as they were being very patient with my fledgling speaking skills). The conditions in this particular prison were very nice, but I am under no illusions that other prisons in Mexico come close to comparing with this institution. I also know that the United States has over two million people under incarceration, almost one percent of the adult population in our country. My time in the federal prison today has helped open my eyes to the need for us to reach out to ALL people – every single person deserves to encounter the merciful touch of the Father through the Son with the Holy Spirit. Sometimes, that encounter may come through one of us, and we have to be ready to respond. No person’s life is worthless, and we cannot let anyone forget this truth, because I think when people do forget it, this is when they begin to slide even deeper into darkness. Let us work to bring the light of Christ to all people, even as we seek to encounter and accept the mercy of God in our own lives. I have had many valuable and enriching experiences in Mexico – new cultures, new people, new places. There are so many memories that I will cherish for a lifetime, but today, the day I spent in prison, will be the day that makes the largest imprint on my heart, the one exception being my encounter with Our Lady of Guadalupe. Todo gloria a Dios. Nuestra Señora de Guadalupe, ruega por nosotros. San Benito, ruega por nosotros. What does it mean to be Catholic, to live a life rooted in Jesus Christ? What does he call each of us to do, to give, to sacrifice? How are we called to love and to show mercy? I have been reflecting on these questions today for two reasons. The first reason begins Fr. Jacques Hamel, a retired priest in France who was murdered while he was celebrating Mass. He was a faithful priest who carried out his ministry, his life, centered on the Faith, someone who parishioners called, “a good priest … who did his job to the very end.” Fr. Jacques lived out his baptismal and priestly call to proclaim the truth to all nations and all people, even if that meant giving the ultimate sacrifice, even to his very last words. How are we called to love Christ and his people? This first reason began with Fr. Jacques and continues to my experience in Mexico, although they are very different. Several times I have visited public hospitals with my pastor, Fr. Augustín, and at each one, we were met by delays, questions, and outright indifference. One hospital prevented us from entering for over an hour, while streams of people proceeded past us and through security without a care in the world. Fr. Augustín later told me that many police officers, being an arm of the government, did not like Catholic priests, and tried everything they could to make life difficult for priests, even in the small ways. Fr. Jacques faced down responded to his call in a very defined and specific moment, and Fr. Augustín responds as well, even if in a different way. This was a shock for my American sensibilities; for as much trouble as we have right now in the United States regarding discrimination against those who are not “with the times”, I would find it unfathomable if someone were to prevent a minister in this manner from seeing one of his people, whether in a public or private hospital. As shown by these incidents, through our Baptism, we are called to sacrifice, love and mercy. Which brings me to the second reason that I am reflecting on all of these questions: today, I celebrate 11 years since my Baptism, Confirmation, and First Communion in the Catholic Church, taking Saint Benedict as my patron. So I am brought to consider how I have lived out that baptismal call in my own life: where am I called to love, to sacrifice, to show mercy? How am I called to give glory to God in the things that I say and do? Although I have discovered some answers, I am still searching, as I am sure many of my Christian brothers and sister do as well. After all, I don’t think most of us have it completely figured out! Man for All Seasons, “this is not the stuff of which martyrs are made.” But as I continue preparation for a different type of calling in my life, the next step of which will be my Pastoral Year, I know that I, and all of us, are called to live out each day molding our lives to Christ. Sometimes we will fall, but then we must return to Him, recognizing that His mercy is ever-present, and that we are called to spread that mercy in our own lives and in the lives of others, something that I pray I will do faithfully when I am, Lord willing, ordained a priest. The Lord knows that since my baptism I have fallen many times, but it is my hope that through the faults and messiness of my life, Christ may work through me and through all of us to bring His message to the world. Please pray for me, for all your seminarians, priests, and religious. Know that you remain in our prayers as well. A Naomh Pádraigh, guigh orainne. Unless you live in a big city (or are visiting one in a foreign country), you may have noticed an occasional streak across the night sky late at night or early in the morning. This signals that Earth has begun to cross the path of Comet Swift-Tuttle and we are fast approaching the height of one of the most spectacular meteor showers of the year: the Perseids. This year, however, the show will be extra special, possibly the best in 20 years. Jupiter has done us a favor this time around, pushing the cometary debris a little closer to Earth. Late at night on August 11th, I highly encourage you to bundle up and head outside. After the moon sets around 1AM, you are in for a spectacular show, if predictions are correct. Astronomers are expecting up to 150 meteors per hour – for those playing the home game, that’s at least two a minute. The best viewing will be early in the morning, after 1AM when the moon sets. Look towards the northeast, but don’t stay so focused on that point that you lose the rest of the sky. If possible, get away from city lights. I usually go to a campground or a local lake. Bring a jacket so you can bundle up – even if you are in a warm climate, sometimes temperatures at night can get a bit chilly during the summer. Bring a reclining lawn chair or a good blanket to rest on so you can observe comfortably without craning your neck. A sore neck will mean a quick end for your star-gazing. Be patient. I know it’s a weeknight, but try to stay out at least an hour. Not only does this increase your chances of seeing some spectacular sights, it will allow your eyes to adjust fully, which can sometimes take up to 20-30 minutes. Also, the show gets better throughout the early morning. Even though the peak is on Aug. 11/12, the days prior or following should still provide a decent show. Bonus: Bring a good pair of binoculars and see if you can identify any objects in the sky. Mars and Saturn will be in the vicinity of the Moon on August. 11, in the south-southwest sky. That reddish star below Saturn on that night? That will be Antares, one of my favorites to spot. More information is available from Astronomy Magazine, EarthSky, or any decent Google search. What is the first time you remember you felt guilt from knowing you did something wrong? If you are anything like me, it was probably pretty early on in life. At my great-grandmother’s house up in the mountains, she used to have this wonderful cookie jar sitting on the counter. She always kept it filled with fresh cookies, and if for some reason it was empty, you could be sure that a fresh batch was soon to be ready, the sweet smell of chocolate chips wafting through the house. After all, what’s Grandma’s house without cookies?! When I was 5 or 6, I remember thinking that I could get to that cookie jar. I had asked earlier if I could have one, but for some reason (probably due to an upcoming meal), I was told no. So, as many a small child will do, I took matters into my own hands. When no one was in the kitchen, I quickly pulled a chair over to the counter. If you know me, you know how short I am; well, I was short for my age then as well, so you can imagine the sight! In any case, there I was with the chair at the counter, my objective in view. I climbed up, and reached as far as I could, just barely grasping the jar. I pulled it over, and opened the lid, seeing the forbidden objects of my desire: those precious chocolate chip cookies. I quickly took one out, replaced the lid, climbed down, put the chair back, and took the first bite into that delicious morsel. It was probably the worst cookie I’ve had in my life. And so it is with sin in our life. In these last chapters of Book II in Augustine’s Confessions, we find him reflecting on the mistakes of his youth, something which I think is common to almost every person. One of the constants of human existence in our fallen life is that of sin: we fall constantly, “for the soul defiles itself with unchaste love when it turns away from you and looks elsewhere for things which it cannot find pure and unsullied except by returning to you” (II.6). Often in life we seek fulfillment and pleasure in things that are not of God. Pick any of the seven deadly sins, and you find that they are all about replacing God for something of this world. Sometimes, this longing can even twist good things into bad, whether it is a good hobby, work in the Church, or love for another person. When we take our focus from God, everything starts to fall apart. So what is the answer? To turn back to Him of course! We can do this through the sacraments, most especially through Confession and the Eucharist. We find through the Sacraments that “no caress is sweeter than your charity and no love is more rewarding than the love of your truth, which shines in beauty above all else” (II.6). In His love, beauty, and truth, we find true fulfillment, rather than in those things of the world, no matter how good they may seem. We must realize that everything we do, no matter how mundane, needs to be directed back toward God. I find this especially present in the maxim of Saint Benedict, “Ora et Labora,” or Prayer and Work. Everything we do can be turned toward God and sanctified. In the Benedictine sense, this takes the form of the daily prayers as “ora” and each monastery’s particular work, such as teaching in the case of my seminary, as “labora.” But from what I have seen in the various monks I’ve met over the years, it also means making the work itself a prayer. Why not offer up your daily trials and triumphs to the Lord, sanctifying every moment of every day? Of course we must set aside some time specifically dedicated to prayer, but all those other times can be directed to the Lord as well. As we strive to direct our lives towards God, we begin to realize the limitless grace and mercy that is the Lord’s. Despite our past mistakes and current failings, we see that He is boundless, and so can repeat the words of Saint Augustine, “I avow that you have forgiven me all.” For God’s mercy is infinite; all we need to do is to turn back to Him. Ayer yo vine a la Parroquia de San Felipe de Jesus. La parroquia es en un barrio pobre, pero la gente son maravilloso. Ellos son muy humilde y generoso. El Señor es bueno todo tiempo! Yo estaré aquí solo hasta 29 de agosto, pero conozco mi teimpo aquí será bendito! The parish is currently undergoing a major renovation. All of the windows in the temporary chapel have the medal of Saint Benedict emblazoned upon them. Yesterday I arrived at the Church of San Felipe de Jesus. While it is in a poor neighborhood, the people are so very wonderful. They are kind, generous, and humble. God is good all the time! I will be here only until August 29, but I know that my time will be blessed! I was especially excited when I discovered this parish has a strong devotion to Saint Benedict, my patron Saint, and Saint Michael the Archangel. The pastor I am with, Fr. Augustín, is a wonderful man – prayerful and loving of all the people with whom he comes in contact; a true example of priestly humility and generosity! He has been so very patient with my fledging Spanish skills so far, and has encouraged me to work hard and to not be afraid using my new language. I am looking forward to learning a lot from him! Over the next month, I will try to update you on current happenings with the usual photos, etc. Word on the street has it that Fr. Augustín enjoys going places, so I think that I will be able to see a lot more of the city, not only during excursions, but shadowing him during his different ministries as well. Por favor ruega por nosotros en Mêxico todavía, y conocen que nosotros somos rogando por tu también. Muchas gracias y hasta luego! Last night, we had the privilege of visiting a local Catholic nursing home, just 15 minutes walking distance from the seminary. I’ve been in quite a few different and very fine nursings homes in the United States, including my service in an Alzheimer’s care facility back at the seminary during the last school year. Taking these experiences into mind, I had certain expectations, but those expectations were quickly thrown out the window. This particular nursing home, run by around 25 religious sisters and many support staff, houses approximately 120 residents. During our tour and visit with the staff and residents, we were greeted with open arms and had some terrific conversations. As the tour progressed, I was struck by the facilities: when one thinks of a nursing home, images of a quasi-hospital environment come to mind, one that is often very stark. Not so here: it felt like home; it didn’t feel like a nursing home. Going through the different sitting rooms and dining areas, I noticed the personal touch given by the sisters, as well as the comfortable environment in which the residents were able to live, with quality furnishings, always-available amenities, and pleasant surroundings. And as you can see in the pictures below, the chapel is bigger than many churches I have visited! Alicia, who was very interested in where we were from and hearing about our background and work in the United States. A wonderful lady with a great sense of humor! Refugia, who, according to the sister, is currently 117 years old (even checked with my professor to make sure I heard her correctly). While I do not doubt the veracity of her claim, the current verifiably oldest living person is 116. Whether or not the records are incorrect or Refugia simply does not have the records any longer does not matter: this wonderful lady was clearly full of life and blessed us with her presence! When we were done visiting residents, the staff did what any Mexican family would do when you are invited to their home: they fed us; in this case, some delicious deserts and cold drinks. I am so thankful for my time at the nursing home. These sisters and residents have been a true blessing, and have provided a wonderful example of charity, compassion, and faith, an example that will help to inform and shape my future ministry. I truly think that both cultures can learn something from each other when it comes to senior care, combining the quality of medical care with the ideal that seniors are valuable, contributing members of society; in fact, I have already seen this integration take place in many places in the United States. We must remember that it is our duty as Christians to uphold the dignity of all persons. That means remembering their worth and treating them as such, never forgetting the inherent dignity that each individual has at every stage of life. Please keep the residents, staff, and sisters in your prayers! I have attached a few photos; there aren’t many since we were busy talking, and I haven’t included any with residents due to the need to preserve privacy. I received a phone call from back home that led to my needing to return to the United States. The only reason why I mention this here is to thank everyone who supports seminarians and our way of life. Without your generous encouragement and support, particularly that of my home Diocese, I would not have been able to return home. So, thank you! Airports are wonderful places for people watching. On my way through security, there were many people who were estadounidenses as our flight was headed directly to Dallas without any other connections in Mexico. There was one young lady who was having a difficult time getting through security and the various checkpoints due to her lack of Spanish. Much to my surprise, I knew enough to help her and serve as a quasi-translator! After spending time with family, I returned to Mexico on the day we celebrated our independence. All of the flights were uneventful, although customs was…interesting. At the request of a seminarian brother, I brought back some SPAM from the United States. Well, I didn’t know how to say “canned meat”, so I told Mexican customs, “Tengo carne en mi mochilla.” Well, meat happens to be on their list of items that they check very carefully. Eventually, I was able to express to the customs agent what it was, and once he saw the two cans of SPAM he laughed and waved me through. A bit nerve-wracking, but you’d be surprised at all the creative ways you can use a language when you really really want to say something but don’t quite have the correct words. I took Uber back to the seminary, and this driver had a bit of a surprise for me. We were having a good conversation, but about five minutes from the seminary, I noticed that all of her MP3s had English titles on the display. I asked her, “Tú hablas español?” Her response? “Yes, but when I learned you were here studying Spanish, I decided it would be good to give you more practice!” Needless to say, she received a 5 star rating on the app for that trip. When I finally returned to the seminary, everyone was wrapping up a barbecue and watching Independence Day. Can’t think of a better way to spend a 4th of July evening. Today we finished one of our classes, “Hispanic Ministry in the United States in the 21st Century: Blessings and Challenges.” Taught by Sr. Guadalupe Ramirez, MCDP, this course covered the history of Hispanic immigration in the United States, as well as the current issues surrounding Hispanic ministry, helping to prepare us to work with Hispanics in our home dioceses back in the United States. Even though it lasted for only three weeks, the course was packed with information, and our professor delivered the material that demonstrated not only her expertise, but her deep faith as well. I will be taking her lessons with me and using them for years to come! In the meantime, we return to our full schedule of 6-7 hours of language classes on Monday. Please keep us in prayer as we approach final exams, and then our month-long parish assignments. Tomorrow, we will visit Puebla and the Great Pyramid of Cholula, and on Sunday we will visit the Pyramids of the Sun and Moon in Teotihuacán. More pictures to come after this weekend. Until then, know that you all remain in our prayers. Nuestra Señora de Guadalupe, ruega por nosotros! 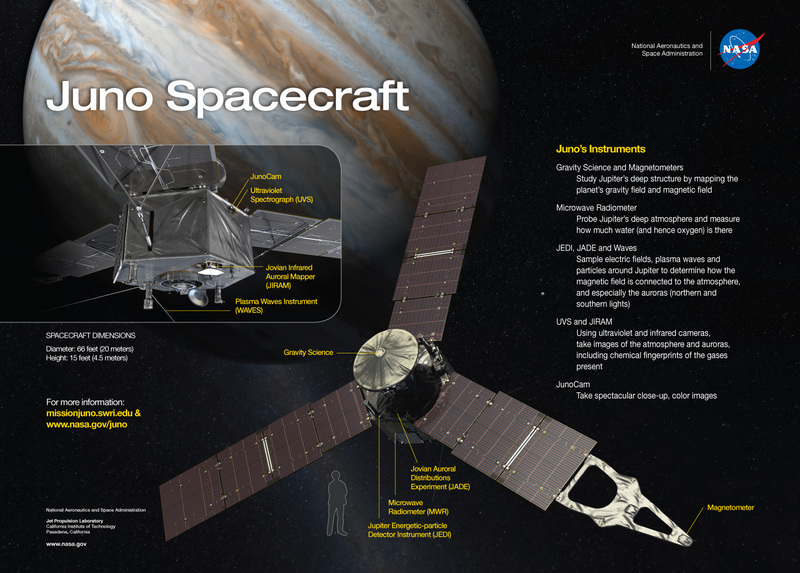 Projected end of mission: After a total of 37 orbits in February 2018, after which Juno will plunge into Jupiter’s atmosphere, incinerated in a fiery cataclysm of space exploration awesomeness. Until I can post some of the sure to be wonderful pictures from the Juno mission and other tidbits, which might be a while considering I am currently a tad busy*, keep looking up! *Speaking of which, a new Aventuras post will be coming up in a couple of days. You can check out the last one here.